Our Athena has been named the "Love Sponge" and gives as much love as she soaks up. Our little girl is turning ONE on the 27th! She has been with us for 9 months now and we are so happy she is part of our family. You have bred an exceptional kitten. We are so pleased that we chose your cattery. You have been helpful and kind. It has been a comfort to us to know that you are a concerned and caring breeder long after your kitten became ours..
Athena likes to help with wrapping the Christmas presents! I can't imagine our lives without Chloe. She is so loving and intelligent, which is a great combination! She is playful and communicative, always getting her point across. We figured if we were going to have a cat, then let's adopt the best....and she is. Thank you for the gift of Chloe. 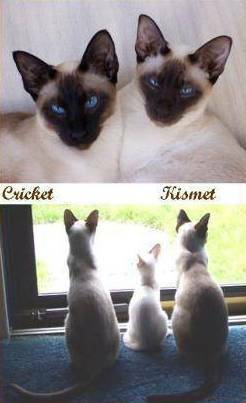 "I thought you would like to see a picture of the kittens we got from you at the end of last summer now that they are almost a year old. They have turned out to be exceptional pets. 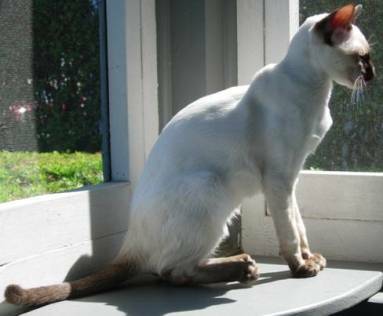 Besides being gorgeous, they are affectionate and smart, each with his own personality. 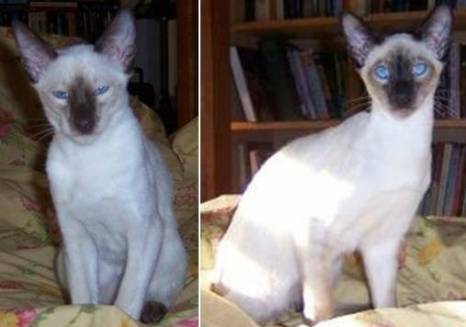 Cricket is outgoing and talkative and Kismet is a little shy and very, very sweet. They love people and are always at the door to welcome us when we come home. 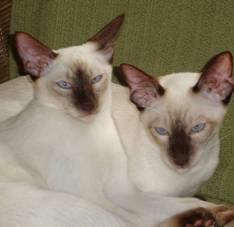 We have owned Siamese cats for 30 years and couldn't be any happier with these guys (which is why we just got our third boy from you a few weeks ago). As you can see from the second picture, he is fitting right in! He came in like he owned the place and it only took a few days for the older ones to adjust to a new addition. 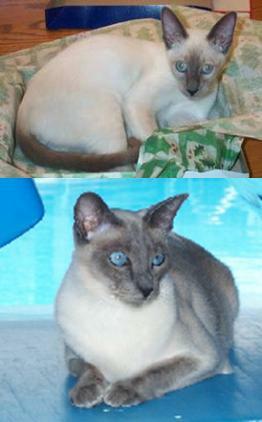 I would recommend Mi Cattery to anyone who is looking for a wonderful cat." 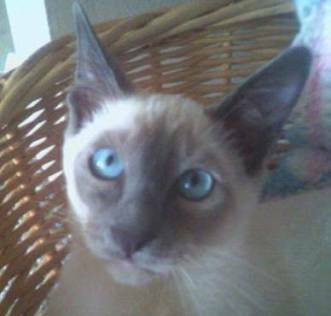 This is my kitten "Poochie" (I know it's a dog name, but he acts just like a little puppy)! He is beautiful and seems to be happy. He is lovable, affectionate and very personable. the first night I had him, I expected that he would cry all night, but not at all. He just rolled up on me and slept through the night. 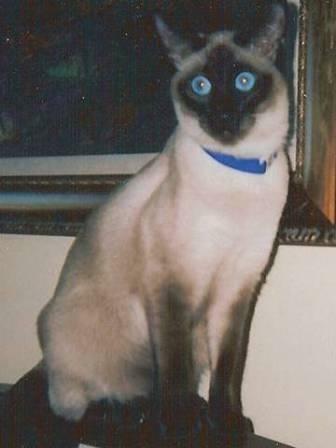 I went from thinking all my life that cats were unpersonable animals to finding out that Siamese cats are wonderful!!!! Thank you Honey for this great pet! We are absolutely delighted to have Romeo as part of our family. He is very affectionate and has become devoted to us in the relatively short time that he has been with us. 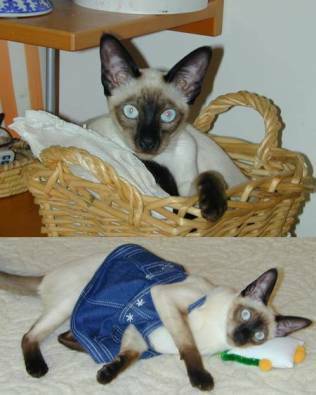 He loves to play, is quite spirited, highly intelligent and very friendly to all who meet him. Everything you told us about the kittens you raise is right on the money. But it feels like he's been in our family forever. He's so sweet and greets us at the door when we come home. His favorite game is laser tag. Sam purrs up a storm and wins over everyone who comes to visit...Even the self-proclaimed "dog people." As you can see from the pictures, he really enjoys our screened-in porch. Sandy has grown a lot since March. She's great. She loves to be around us all the time, following us everywhere. She also loves when we have guests over. She throws herself in front of the doorway when it is time for them to leave, as if she is telling them not to go. My beautiful Sapphire now one year old. She is quite beautiful . She has filled out and has a beautiful coat. Sapphire is the best cat I have ever had because she's got so much personality and is so playful and loving. Love her to pieces! She is a loving, playful and very affectionate kitty. It's "play with me and pet me " all the time”. She comes on my lap and rubs and purrs. We are devoted to each other. She is smart, affectionate, a great companion and playful. Sapphire is badly spoiled. She is the love of my life. Thanks a million. You are a great breeder and if you need a testimonial at any time, count on me. 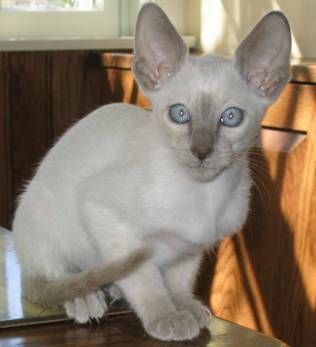 My name is Jeff and I purchased 2 chocolate point Siamese kittens from you in February The kittens are wonderful. and I absolutely adore them. 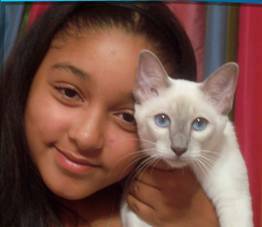 The boy on the right of the picture is Teeko and the girl is Meesha. These cat's are the most loveable, affectionate and intelligent cat's I've ever had. They follow me down the stairs in the morning when I leave and when I come home they are waiting by the door. They are always talking to me and they demand attention. They are everything that a person could possibly want in a pet.